Making your own almond milk is SO easy! All you need is a blender (I prefer Vitamix), a nut milk bag or cheesecloth, raw almonds, and filtered water. I soak the nuts for 24 hours to remove the dust or any mold from shipping and handling, which also improves the nutritional value. Then drain the nuts and use fresh filtered water to blend. Cheese cloth is great because you get so much in one package, it’s so versatile, and you can use it on a million things (making nut cheese, poaching fish, nut milks, straining seeds from fruit, and lots more.) However, I bought a nut milk bag and it is so much faster and easier to use the nut milk bag. I use almond milk in so many things. I cook with it any time a recipe calls for milk and no one can ever tell the difference. I also use it in my smoothies to make them creamy. You can add it to coffee or tea, cereal, or just have a refreshing glass with ice. The milk will stay fresh about 3-5 days in the refrigerator. I keep them in mason jars, since each jar is about 2 cups and this recipe makes 4 cups. I use two jars so the milk stays fresher for use later in the week. 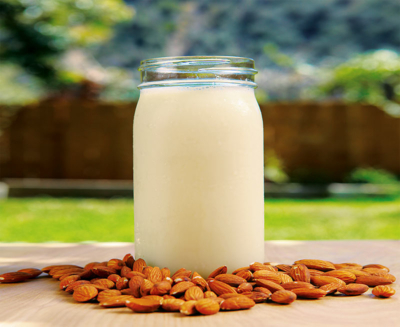 Once you try homemade almond milk it will be almost impossible to drink store-bought milk again, which is pumped with artificial crap to keep it fresh on the shelves. The sad part is that a typical consumer would have no idea about what is inside of store bought almond milk or that it’s actually bad for you. The toxic ingredients found in almond milk stress your immune system and weaken your health. The ingredients are also misleading and include words such as Vitamin A Palmitate, which can cause birth defects and bone fractures. Vitamin D2, which if taken in excess, can cause headaches, nausea, vomiting, abdominal cramps, muscle weakness and bone pain. But the worst thing about store-purchased almond milk is it usually doesn’t even contain much almonds! In light of this, I suggest making your own nutritious and delicious almond milk. And the great part is, it’s really easy! Soak the almonds in 2 cups of water overnight. Drain the nuts and rinse. Blend 1 cup of almonds and 4 cups of cold water on high for 2 minutes. Pour the almond mixture into the cheesecloth or nut milk bag. Squeeze out excess milk. Pour into mason jars or a milk jug. Save the leftover almond meal for future recipes. You can do this by heating the almond meal at 170 degrees Fahrenheit for 2 hours. Make sure to mix the almond meal frequently while baking to dehydrate the water from making the milk. Use Chef V’s Almond Milk right away or store in an air tight container for up to 2 weeks. You can add some almond milk to your Green Drink to make it a little creamy. Yum!